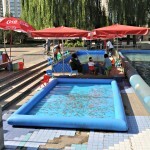 « Day 114 in Beijing: Chaoyang Park, Part 2. 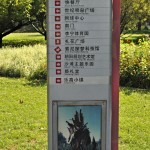 Day 115 in Beijing: Chaoyang Park, Part 3. As we ended the boat ride, we decided to walk around the park for a few more minutes. We went by a grassy part of the park where people had up put tents for the night and were getting ready to go out and play with kites. 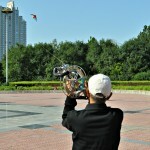 Beijing, for those that don’t know, is awash with kites when the weather is nice. People here love them. And they love to fly them to incredible heights. As we continued our walk, we came across a guy with something that was spinning like made and looked a bit like a medieval torture contraption. 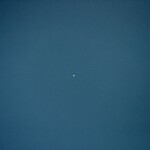 We watched, totally confused, and then noticed a tiny thin line going up to the sky. We followed it with our eyes and noticed a kite way up into the sky. This kite was about half a mile high in the sky! The cutest bathroom around Beijing. They’ve got disco pants and baby shoes. This place has got everything including LegoLand! We ended up walking around for another 15 minutes before we had to meet our friends for 2 hours of badminton. That, my dear friends, will be a post for tomorrow.